Badger & Dodo, the speciality coffee roasting company from Fermoy, Co Cork is expanding with the opening of a second Barista Bar at Cork Airport. The new outlet will be located in the Food Republic food court operated by Aramark. From roasting their own artisan blends of coffee to pouring work-of-art flat whites and lattes, Badger & Dodo are the unequivocal masters in everything coffee. The Badger & Dodo Barista Bar will offer a wide range of deliciously blended fresh coffee in addition to a selection of freshly baked pastries, cakes and sandwiches. Since opening in Cork Airport with Aramark in 2016, Badger & Dodo’s artisan coffee has proven a huge hit with passengers. “Cork Airport has been a huge success for us. We’ve had great feedback to our first Barista Bar and we’re delighted to partner with Aramark to bring Badger & Dodo coffee to even more visitors and staff at the Airport. It is a great opportunity to showcase our specially roasted coffees to Irish and international consumers” said Brock Lewin, Badger & Dodo. The new Badger & Dodo Barista Bar continues Cork Airport’s €4 million investment programme in improving facilities for passengers at the busy airport. With the appointment of Aramark, the food and beverage offerings at the airport have seen the biggest change including the opening of the new food court last May. Aramark’s policy of showcasing the very best in local artisan food producers has resulted in additional business not only for Badger & Dodo but for other local producers including Gubbeen Chorizo, Ardsallagh Cheese and Ballycotten Smoked Salmon. 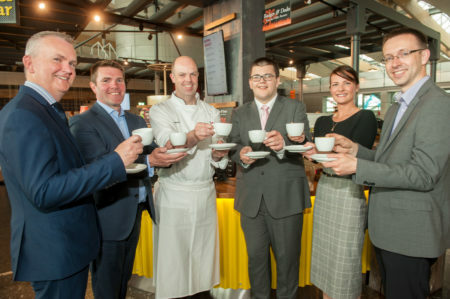 Tara Ramaker, Regional Manager, Aramark said, “Aramark continues to work closely with the team at Cork Airport and local food producers to develop menus that showcase what makes Cork the gourmet capital of Ireland. We are delighted to launch the new Badger & Dodo Barista Bar for passengers flying from Cork Airport. Badger & Dodo offers something different and perfectly complements the existing food and beverage portfolio in the terminal”.